UU’s Ethan Snapp (20) scored a career-high 36 points in UU’s 81-79 loss to visiting Charleston on Wednesday. Urbana University junior guard Ethan Snapp scored a career-high 36 points in the Blue Knights’ 81-79 loss to visiting Charleston Wednesday night in MEC action. Snapp helped lead a late Blue Knight surge and his free throws with 21 seconds left made it a one-point game, 79-78. Snapp was 14 of 14 on free throws and a game high six treys on eight attempts from beyond the arc. The junior’s scoring total is the third-highest in UU’s NCAA Division II era while he posted a team record for best three-point shooting percentage (.750) in the school’s D-2 era. The Blue Knights (2-6, 1-4) will be traveling to Institute, W. Va., on Monday for a conference matchup against West Virginia State at 7:30 p.m. UU returns home on Saturday, Jan. 5, 2019 against Salem with tip-off slated for 3 p.m. In Wednesday night’s early game, UU’s Sylvia Hudson scored a career-high 30 points and added 11 rebounds in the Blue Knights’ 78-63 loss to Charleston. 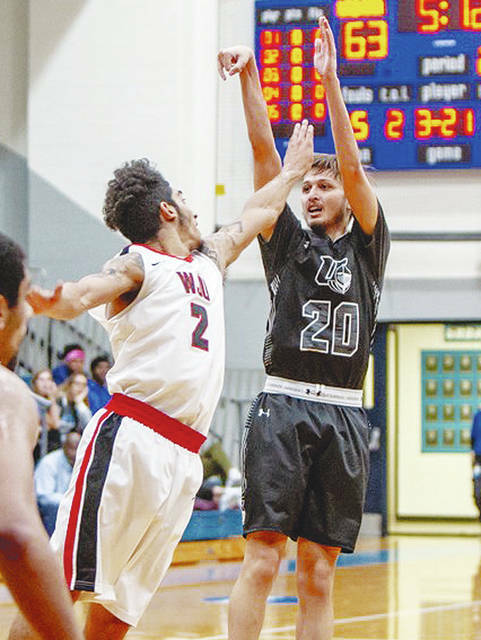 The UU women (1-6, 1-4) will play at West Virginia State on Monday at 5:30 p.m.
https://www.urbanacitizen.com/wp-content/uploads/sites/36/2018/12/web1_snapp.jpegUU’s Ethan Snapp (20) scored a career-high 36 points in UU’s 81-79 loss to visiting Charleston on Wednesday.